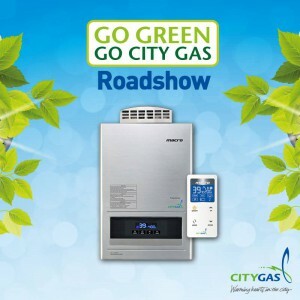 City Gas is holding their annual roadshow at Toa Payoh HDB Hub Atrium this Wednesday till Friday, 20th September. City Gas will be showcasing their range of gas water heaters, clothes dryer and various hobs and hoods. Come down to explore a suite of energy-efficient gas solutions for your HDB home! We will be showcasing our range of HDB gas water heaters, gas clothes dryer & various hobs & hoods. The first smart gas water heater, Macro MA-1210FER, which comes with energy-saving ECO-mode & a convenient remote control, will also be launched! Irresistible prices for gas water heaters – 3 days only! Grand Lucky Draw: Stand a chance to receive full rebates on your purchase!
. 3 months free gas for gas water heater purchases is limited to $20 a month.
. 3 winners will be selected for the Grand Lucky Draw. The draw will be conducted the week after the road show, & all winners will be notified by phone & mail.
. All promotions will only be applicable at the 3-day road show, unless otherwise stated. Promotions are not applicable for online, phone, or Gallery purchases.